Ford Motor Co. is giving a hint of what forthcoming models will look like with its Evos concept car, a streamlined four-seater with slender LED headlights and a high front grille. 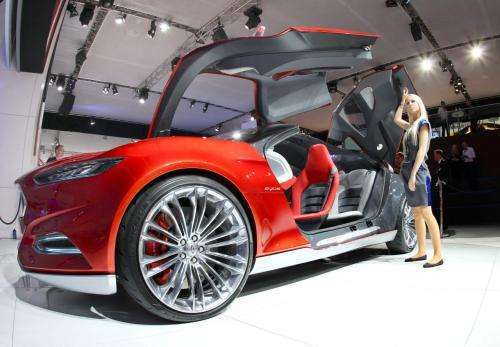 Four gull-wing doors, front and rear, were popped up as the car was displayed at the Frankfurt auto show on Tuesday. The outlandish doors probably won't make it to production. And the extreme fastback silhouette, with a low raked back windshield and roofline that sinks sharply to the rear, may be softened. But Ford's group vice president of design, J Mays, said several Evos elements might appear on production models to be unveiled in just a couple of months. For instance, the sleek, light-emitting diode headlights, a low aerodynamic profile, and the high-set black grille. "Design elements that you see on this rather extreme concept car will work their way into not one, but a whole host of vehicles," said Mays. The headlines in particular are a novelty. Some manufacturers use large headlights as a prominent design element. But Mays says the Evos' lights  mere slits  will help give a premium, high-tech look to what will be mass-market vehicles. "Those, surprisingly, are very practical and as we go to LED technology it has allowed us to really bring down the heights. So those you will see in production  maybe not that small, but noticeably smaller than the norm from other manufacturers." The thin lights also help reduce the size of the raised grille, which gives the car only one major opening up front, instead of two, for better aerodynamics. The Evos design elements will appear on cars in all of Fords' global markets. @Vendicar_Decarian why did you read the article then ? So it is all about the looks. Zilch about the co-efficient of drag, fuel consumption etc. Mid-day TV watchers will be a dither and agog.